Easy Indian recipes: This kabob is cooked with a combination of tuna, potatoes, spices, and herbs. 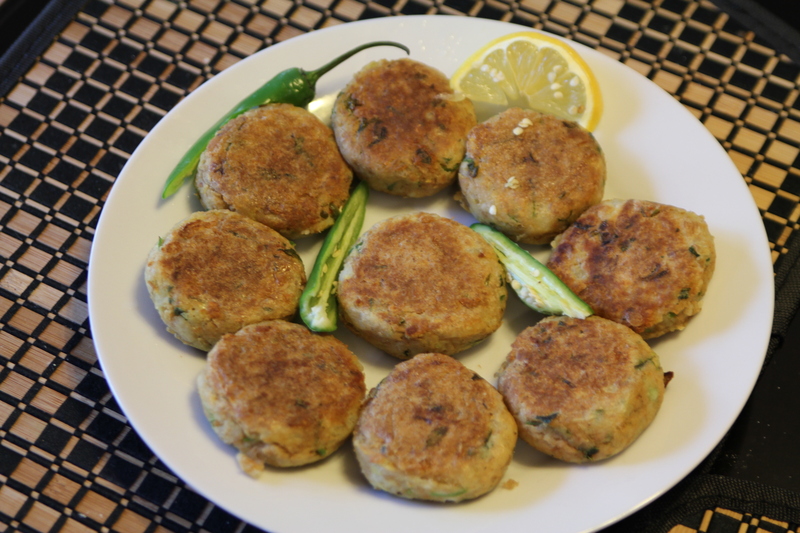 Tuna Kabobs is one of the many easy Indian recipes you can make for your family. This kabob is made with a mixture of tuna, potatoes, spices, and herbs. Cook potatoes in the microwave until they are tender. While potatoes are cooking, chop up the following: green chili, cilantro, and green onion. While potatoes are cooking, open up the cans of tuna and drain the water. Once potatoes are done, peel potatoes and mash them in a large bowl. Make sure you mash out all of the knots. Add the following to the potatoes: tuna, cilantro, green chili, green onion, red chili powder, black pepper, and salt. Mix it all together really well. Mold the potato mix into the shape of a fat yet still flattened ball. (See photo above). Take a separate bowl and break eggs into it. Add 1/8 teaspoon of black pepper. Then, beat the eggs. Add 2 tablespoons of corn oil to a pan on high heat. Take the pre-shaped potatoes and dip them into the egg mixture. Add it to the frying pan. Repeat this step as needed. Fry for 5-8 minutes on one side or until they turn brown. Flip over kabobs. Add 2 tablespoons of additional corn oil. Fry for 5-8 minutes until kabobs turn brown. Serve. You can eat it on its own or with an Indian bread. That’s it! Check out some of our other easy indian recipes.